Liverpool are guaranteed the number one spot on Christmas Day. Friday night's 2-0 win at Wolverhampton Wanderers moved the Reds four points clear at the top of the Premier League, with second-placed Manchester City set to host Crystal Palace on Saturday. 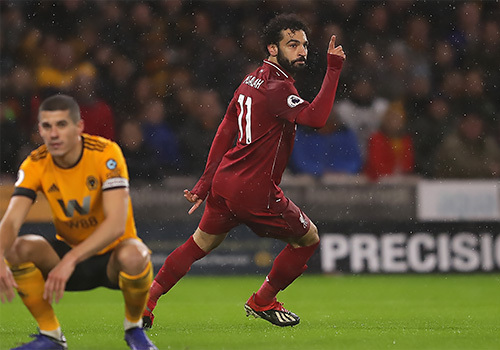 Mohamed Salah put Liverpool in front at Molineux with a fabulous flicked finish on 18 minutes, and Virgil van Dijk doubled the lead after the break as the Reds kept the pressure on the defending champions. 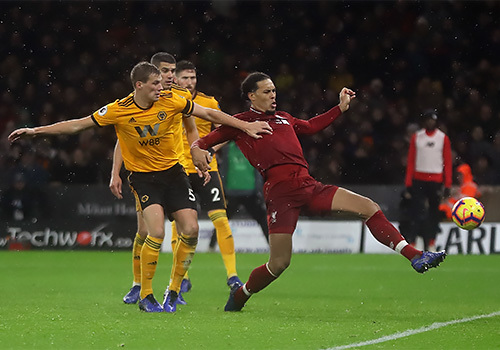 Liverpool's No.11 showed flashes of his brilliant best at a rain-soaked Molineux as he notched his 11th Premier League goal of the season. 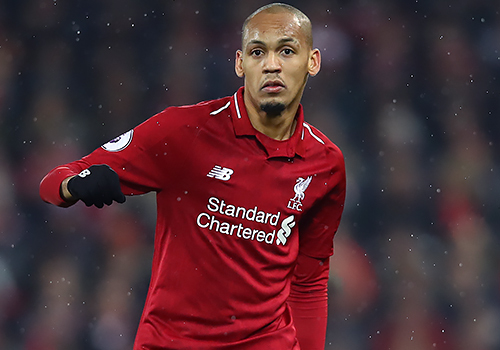 Full of flicks, tricks and nutmegs, his outside-of-the-boot finish from Fabinho's cut-back was performed with jaw-dropping nonchalance. Salah thereby became the outright top goalscorer in the Premier League, one ahead of Arsenal striker Pierre-Emerick Aubameyang before his fixture this weekend. But it's the importance of the Egyptian's strikes that is worth noting. Eight of his finishes have been opening goals and set the tone of the match. 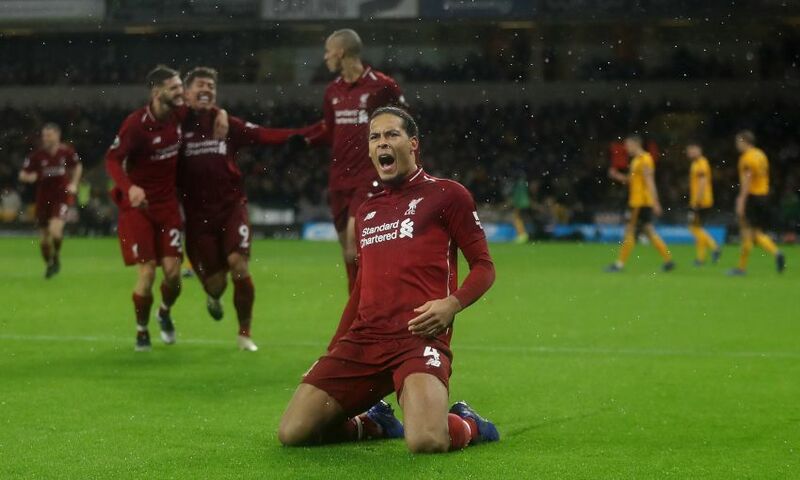 Liverpool centre-back Van Dijk chose the perfect moment of the match to score his first Premier League goal for the club, with Wolves beginning to show signs of mounting a fightback in front of their fans. The hosts had finished the first half strongly and, after weathering a Reds storm at the start of the second, looked to have found some attacking impetus. However, when a short corner was cleared only as far as Salah, Van Dijk was there to latch onto his teammate's wonderfully floated cross over the defence to side-foot home on the stretch and give the visitors a two-goal cushion with 68 minutes gone. Having scored decisively at one end, the Dutchman was then back snuffing out any danger at other end as Liverpool closed out the match. The No.4 won 100 per cent of his aerial duels, made five clearances, three possession regains, two tackles and one interception. Jordan Henderson made his 300th appearance for Liverpool but it wasn't just a milestone match for the captain, he was an instrumental figure in the centre of the pitch. The 28-year-old made more passes (70), with better accuracy (90 per cent) and won the ball back more times (seven) than any of his midfield colleagues. His wonderful sprayed pass down the line for Salah to launch yet another attack late on in the match was probably the pick of the bunch. The skipper displayed a typical eagerness to orchestrate proceedings and since making his debut for the Reds in August 2011, only Philippe Coutinho (43) has provided more assists than Henderson's 39. Liverpool boss Jürgen Klopp fielded an unfamiliar midfield at Wolves with Fabinho, Henderson and Naby Keita starting together for the first time. Keita operated mainly on the left and with Sadio Mane dropping in on the right flank, the Reds functioned as a curious midfield four at times too. The unit grew into the game, with Henderson and Fabinho sitting deep and the other two pushing on. However, it was a clever cut-back from a forward foray from Fabinho that led to the first goal. The Brazilian's neat delivery set up Salah with his second assist in a week. With fixtures coming thick and fast over the festive period, Klopp has yet another midfield combination he can rely upon. Victory in the Midlands not only consolidated Liverpool's position at the top of the table, it also saw Klopp's men extend their club-record unbeaten run in the Premier League to an incredible 19 matches. The run, which includes every top-flight fixture this season plus the final game of last term, continues to improve on the previous best of 17 set by Rafael Benitez's Reds in 2008. Klopp's side have now won 16 times during their unbeaten streak, scoring 43 goals and conceding just seven.